ABC’s Fresh Blood initiative has helped to create content that explores a plethora of Australia’s rich and diverse stories, something that stands as a testament to the types of immersive and distinctive storytelling forces there are. But one story that has found a strong voice which stands out from the crowd is the comedy series The Angus Project, making the leap from web series to television with a half-hour pilot which is set to premiere on December 4 on ABC TV. 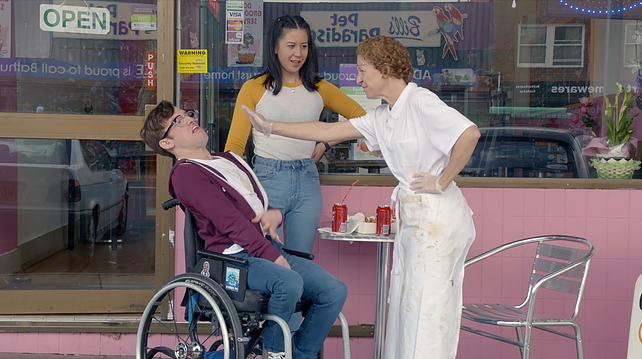 The series is based on the real-life relationship between Angus, a young aspiring actor living with cerebral palsy, and his carer Nina, as they live through their drunken, wild, and incredibly vivacious days as university students in Bathurst, Sydney. With that extra sparkle of hilarity and situations inspired by real-life scenarios, the series invites the audience into a dynamic between two people that feels lived in from the first minute. What helps keep the series firing on all cylinders, is the chemistry between the two leads, whose close bond you’ll be immediately fixated by. Angus and Nina will immediately feel relatable to most young people across Australia, especially those who are known to black out with their best friends on a Saturday night. As the two quip and banter with each other, you’ll get a sense of the kind of Broad City and It’s Always Sunny in Philadelphia-esque dark comedy that is distinctly unlike most on Australian television. The comedic tone never strays away from the profane and the innately funny, never hesitating away from the partying, hard drinking and drug use that plagues most students while in their uni days. But what makes the series appealing remains its determination to never shy away from Angus’ story or his disability, nor do they portray his story as a light-hearted, inspirational, or watered-down. Angus is portrayed as a fully formed person with a rambunctious lifestyle, who lives his life the way he wants. And Nina is there to help him live it, one bong at a time. As the series makes the transition in format from web series to television, it allows the pair to dig deeper into the life of each character, the friendship that they share, and the ins and outs of the city of Bathurst as a whole. In doing so, it has opened up a new facet of diverse storytelling that’s bound to leave the Australian audience desperate for more. There’s something to be said about the inherent ability the series holds to shine a light on people with cerebral palsy who are out living their life to the fullest. It’s about time more Australian networks such as the ABC invest in diverse, hilarious stories such as The Angus Project. But for now, it’s time for the audience to break our the booze and party with Angus and Nina like there’s no tomorrow. The Angus Project will premiere on ABC TV on December 4. You can currently catch the three-part web series ABC iView here. For more information on the series, follow on Facebook.